Ever since I was a little kid I loved playing games. Sorry, I mean that I lived to play games. I played card games, pinball, computer games, and board games. 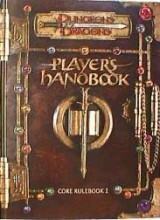 Then when I was all of 13 years old I discovered this great game called Dungeons and Dragons. Well that was 10 years ago and I still think that it is the finest game there is. So when I was given the chance to review the Dungeons and Dragons 3rd Edition Players Handbook I jumped at it. I have to admit that I was worried that I would be as disappointed with it as I was with the ill-fated conversion of the DragonLance Game Setting to the Saga System. My fears were unfounded, though--this game is a worthy successor to 2nd Edition AD&D. When you first see this book you\'ll probably want to call up Jon Schindehette and Dawn Murrin (the Visual Creative Director and the Art Director respectively) just because it looks so good. The cover makes you think of some exotic tome containing lost and forgotten knowledge. Then, when you open it and begin to look through, in almost no time you will find page after page of excellent artwork making the races and characters come alive in your imagination. I, in particular, like the illustrations of the races because they allow players to better visualize their characters. For instance, I had been playing second edition for over a year without once realizing how tall (or should I say how short) a halfling really was. With these pictures new players can picture the way their characters look more quickly and get into and enjoy the game more. In second edition you determined skills through the secondary skill system, or as an option the proficiency system. In third edition, the skill system is most similar to proficiencies. Each class is given a list of class skills. There are other skills that can be learned by any class called cross-class skills. All of these give a huge choice of skills to a character. To develop ability in a skill, skill-points are spent to obtain ranks. Your rank and the appropriate characteristic modifier are applied to your roll on a 1d20 when using the skill. Each class has a certain amount of skill points they gain each level. This skill system provides the opportunity for characters to be made unique by emphasizing or ignoring certain skills. All in all, this system was well thought out and detailed in an easy to understand manner. It seems that third edition was developed around giving players the opportunity to develop unique characters. So in third edition a new aspect called feats were added. These are outstanding. They incorporate a wide range of possible bonuses for characters. They allow mages to learn how to use armor or warriors to fire a bow in a melee effectively. These feats allow characters to grow and change in ways that would not even be allowed in second edition. There have been many rumors abounding for the last year or so about the changes that the character classes were undergoing and what classes would be included into third. So it is probably best to put some of these rumors to rest. First, all characters regardless of class use the same experience chart. Unfortunately, there is no mention of psionicists or psionics at all in the Players Handbook; although, I believe that they will be incorporated at a later date like they were with second edition. I\'m glad to say that the monk and the barbarian are back in third. In addition they\'ve created a new class called the sorcerer that is very powerful but also limited in important ways. So the grand total is 11 different possible character classes. What are these classes, you ask? Well, they are: the Barbarian, Bard, Cleric, Druid, Fighter, Monk, Paladin, Ranger, Rogue, Sorcerer, and Wizard. These are all separate classes--not sub-classes. Each class has its benefits and drawbacks, so I\'ll discuss each briefly. The Barbarian is a fighting machine with 1d12 hit points each level, multiple attacks by sixth level, and the ability to fly into fits of rage that make him faster, stronger, and tougher. He can be a veritable enemy blender. Having lost several abilities that veteran players will remember from the days of yore, the barbarian was changed from a wilderness warrior into a very tough fighter. But don\'t get me wrong; I would love nothing more than to have a half-orc barbarian between me and the people who want to see if I\'d make a nice throw rug. The Bard has a few good points such as the ability to use his music for a variety of effects, such as inspiring others, countering sound-based magic, and fascinating others. In addition, he has bardic knowledge that can be used to see if the bard has heard any useful information about virtually anything. The bard unfortunately has very poor magic ability (the ability to only cast 0-level spells until third level), he gains half as many skill points as the rogue, and has fairly mediocre fighting ability. The Cleric is a very strong character with a good spell list and the ability to cast bonus domain spells. This is coupled with his ability to wear any armor and to even, depending on the deity, use martial weapons. Even better, the clerics\' ability to ditch a pre-prepared spell in favor of a healing spell of equal level frees them up to pick out useful spells for situations that might arise without sacrificing their ability to heal themselves or their party. Druids haven\'t changed much in third edition. They still have their ability to shape change, to become immune to poison, and to move normally through undergrowth without leaving a trail. The only things that they have lost are the ability to enter and survive on the elemental planes at will. Since this was only a very high level ability I don\'t consider it a big loss as the new druid has the ability to shape change into elementals by then. The fighter has been vastly altered since the lion\'s share of their abilities from second edition were made into feats for third or incorporated as part of each class, such as the multiple attacks per round. As a consequence, the fighter class is given so many bonus feats that it gets them almost every level. Other than that, though, they get no other real bonuses. The monk was an old favorite that has been resurrected in third. In general their abilities are similar to the abilities they had in back in Oriental Adventures, but these have been revamped and better explained. And the annoying negatives that they used to have were removed so that can survive to a high level. Paladins and ranger were left mainly alone with certain slight alterations-for example, a paladin\'s laying on of hands can be used to damage undead, and the ranger gets bonuses when fighting a selected class of creatures. The rogue is the new version of the thief. When I first saw this class, I was left asking, \"Where are the thieving percentages?\" I didn\'t have to worry; the \'thieving\' abilities were made strictly into normal skills, and the rogue gets a huge amount of skill-points each level that make them very good at what they do. Sorcerers are a new class designed for third edition. They are spell casters that can cast the same spells as a wizard, but they do not have to choose which spells they can cast each day. Sorcerers let fly with whichever one of their spells they want so long as they have spells of that level available to cast. This is an excellent class that allows players unused to playing spell casters to learn how to play them and to develop confidence in their ability to play them. The Wizard wasn\'t changed much in third. They still have the ability to scribe scrolls and to summon familiars, but they also gain bonus metamagic feats that can make their spells phenomenally powerful. I mean, if you want to have a character that can toss a fireball that automatically does maximum damage and has no verbal components, the wizard is your man. The races in third are very good for the most part. They almost all have statistical bonuses that even out. The only one that\'s a bit eccentric is the half-orc who gets +2 strength and ?2 to intelligence and charisma; but if you want to play someone who\'s stupid, ugly, and strong, go for it. Each race has certain abilities that help such as an elf\'s immunity to sleep spells or a human\'s additional feat at first level. Because each race has its own bonuses that are fairly equal to each other, the races are balanced. This is a big improvement over second edition where the races weren\'t very balanced and which led to entire bands of adventurers that were 90% non-human. Lord, I just noticed how long this review is getting so I better wrap it up. The Dungeons and Dragons 3rd Edition Players Handbook is well balanced. It encourages players to develop characters that have personalities, and gives them nearly endless opportunity to customize their characters to suit their own imagination. It has been made easier to understand, which is excellent for new players. And to all you veteran gamers out there that have spent more on their collection of second edition books than you have on your cars, all I can say is that change can be hard, but that this game is worth it.